Third molars are the last teeth in our oral cavity to erupt and are the most distally located teeth in the oral cavity. They are more popularly known as wisdom teeth as they erupt after the age of 18 yrs, so they are referred to as the wisdom teeth as people consider it the age a person becomes more mature mentally. We cannot see the 3rd molars erupting normally into the oral cavity in all humans, as they might be submerged under the soft tissue or inside the bone. 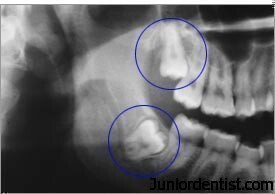 this condition is called as Impaction which is of many types – Types of Third Molar Impaction. And in these cases depending on the type of impaction treatment plan is decided. Research: According to ongoing research, the scientists are formulating that dental arches in the humans are shrinking in size, and as a result the 3rd molars are being discarded as the humans are evolving with nature. We can notice that the size of our teeth in oral cavity have not changed, still some of us do not have room for the 3rd molar. But we cannot totally forget about them if they do not erupt into oral cavity, they sometimes lie unerupted under the tissue and are known as Impacted Teeth, which can cause infection in the oral cavity and need to be removed through surgery. So my advice is that if you are above 25yrs and your wisdom teeth have not erupted then you should have a check on them every few years. In case of Infection: As you can see in the above picture sometimes the 3rd molars grow sideways (impaction) in many patients which makes them rub against the adjacent teeth roots and causes trauma & infection to the adjacent tooth as well and causes excruciating pain in the mouth, so in these cases they are best removed to protect the other tooth as well. So it is best to keep a regular check with X-ray, and should not be neglected if pain is felt around that area. It is better to go for Root Canal if you have pain, as it suggests that the Root is exposed.